Like many others, Bert Guerra believes that if Dr. Martin Luther King Jr. were alive today, he would be here in South Texas defending the area from a border wall. Guerra is the founder of the Historic Cine El Rey Theatre Foundation, a nonprofit organization that will host its ninth annual MLK Day at Cine El Rey celebration and commemorative walk on Monday. The event comes as local advocates continue to oppose President Trump’s border wall through protests. Such activism has been spurred in the wake of the Trump administration’s 2018 zero tolerance policy leading to family separations at the border, as well as a current stalemate with Democratic leadership in the House over border wall funding, which has led to the longest government shutdown in U.S history. Guerra said King’s provision will be at the forefront of the event. Hidalgo County Judge Richard Cortez will welcome attendees at the theater Monday and Sister Norma Pimentel will lead the ceremony’s prayer. Participants will embark on a three-block walk that starts at the theater, located at 311 S. 17th St. in McAllen, and ends at the Bentsen Tower. The group will then make its way back to Cine El Rey for free entertainment and food. The event is scheduled to run from 5 to 8 p.m. In a prepared statement, Pimentel said it is important to promote humanitarian values during times of adversity. 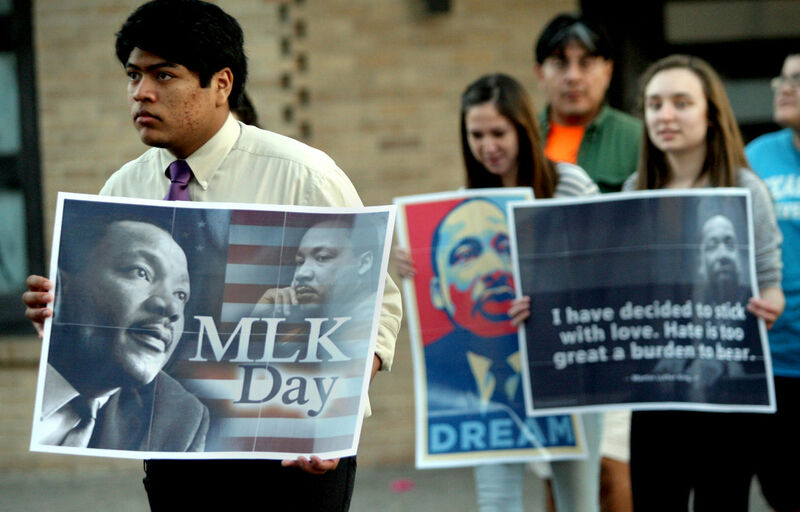 “MLK Day gives us an opportunity to pause and reflect on humanity, on how we treat those around us,” Pimentel said. “It is important for us to ask ourselves: Are we kind to one another? Are we generous? Are we loving? Do we offer comfort to those who need it? Are we fighting or are we creating peace? Are we loving or are we suspicious? We also reflect on the loving example of Dr. King whose words are so relevant today. The nonprofit was founded in 2010 and began hosting the walk the following year. Guerra said that preserving King’s message of courage and peace was the inspiration for the organization. Depending on the weather, the walk attracts about 300 people each year. This year marks the 51st anniversary of King’s assassination in Memphis, Tennessee. Shot dead while standing on the balcony of the hotel he was staying in on April 4, 1968, King was there that week preparing for a march on behalf of striking Memphis sanitation workers.